When you stay at Santhiya Koh Phangan Resort & Spa in Koh Phangan, you'll be on the beach, a 1-minute drive from Thong Nai Pan Noi Beach and 7 minutes from Thong Nai Pan Yai Beach. 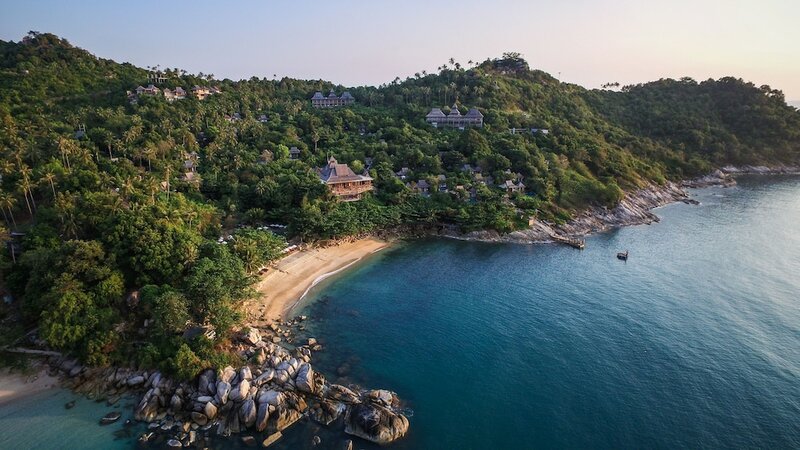 This 5-star resort is 3.1 mi (5 km) from Bottle Beach and 11.1 mi (17.9 km) from Thong Sala Pier. Make yourself at home in one of the 99 air-conditioned rooms featuring refrigerators and minibars. Rooms have private balconies. Flat-screen televisions with satellite programming provide entertainment, while complimentary wireless Internet access keeps you connected. Private bathrooms with separate bathtubs and showers feature deep soaking bathtubs and complimentary toiletries. Pamper yourself with a visit to the spa, which offers body treatments and facials. You're sure to appreciate the recreational amenities, which include 2 outdoor swimming pools, a steam room, and a fitness center. Additional features at this resort include complimentary wireless Internet access, concierge services, and babysitting/childcare (surcharge). Getting to nearby attractions is a breeze with the area shuttle (surcharge). Grab a bite at one of the resort's 2 restaurants, or stay in and take advantage of the room service (during limited hours). Unwind at the end of the day with a drink at the bar/lounge or the beach bar. A complimentary buffet breakfast is served daily from 7 AM to 10:30 AM. Featured amenities include complimentary newspapers in the lobby, dry cleaning/laundry services, and a 24-hour front desk. A ferry terminal shuttle is available for a surcharge.